Do you ever feel shocked and panic when Google Chrome web browser opens only either the New Tab page or your pre-defined specific page or set pages on startup, instead of all the tabs loading with important web pages at the time of exiting Chrome, regardless of by accidental or by intention? Of course, if you accidentally closed Chrome and now lost all the opened tabs in the last browsing session, your level of anxiety or nervousness may be higher, considering you may haven’t finished reading the web pages or have unfinished tasks to do on the closed tabs on the previous browsing session. Chrome has built-in feature to allow users to open recently closed tabs, including ability to reopen and restore all open tabs in the previous browsing session. The tutorial details the steps to restore the previous session and reopen last opened tabs in the previous session after exiting Chrome. The trick works even if you don’t see Chrome to continue where you left off on startup. You should not playing around with Chrome by running or closing Chrome once you noticed that you may have accidentally closed Chrome browser without saving its tabs state. Doing so potentially caused Chrome to overwrite the browsing history, and wipe off the previous session’s history completely (Chrome stores the current and last session with the active tabs during the sessions only). Instead, you should try to perform the steps to recover the last session’s tabs immediately if you want to try to get back those web pages. 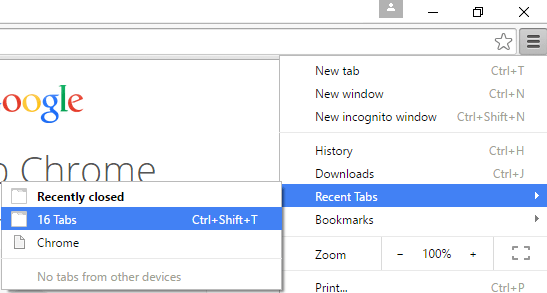 In Chrome, open Chrome menu (the 3-bar hamburger button) to customize and control Google Chrome. In the listing of recent tabs, you should see a entry named “x Tabs”, where x is a number which indicates the number of closed tabs in the previous session. Click on the x Tabs entry to restore all previously closed tabs in the last session. An alternative method is by pressing Ctrl + Shift + T keyboard shortcut. However, do note that if you have closed any tabs in current session, Chrome will attempt to reopen the recently closed tabs instead, rather than opening all tabs from last session. The best way to instruct Chrome to automatically reopen all opened tabs from previous sessions is by configuring Chrome to continue where you left off under On startup heading of Chrome’s Settings. The trick should works on all WebKit-based browser, such as Yandex Browser, iCab, 360 Browser, Maxthon and etc.